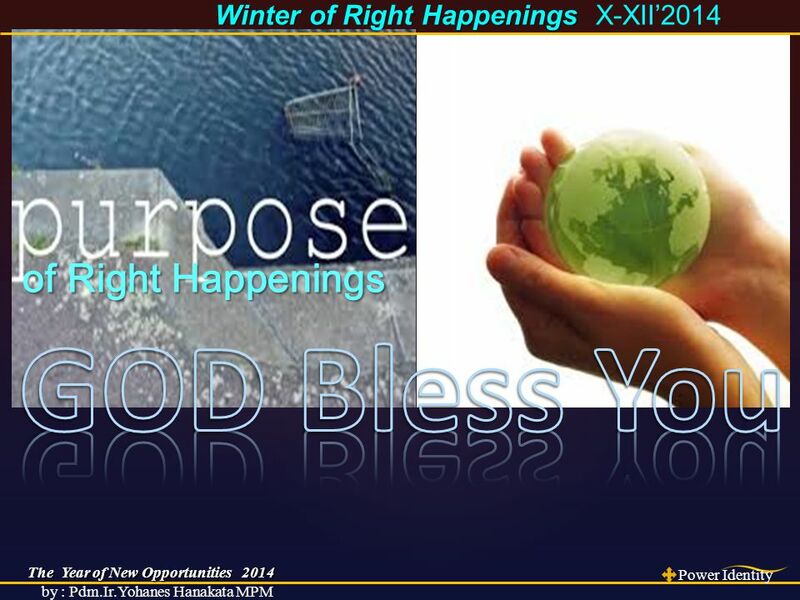 The Year of New Opportunities 2014 Power Identity by : Pdm.Ir.Yohanes Hanakata MPM Winter of Right Happenings Winter of Right Happenings X-XII’2014 of. 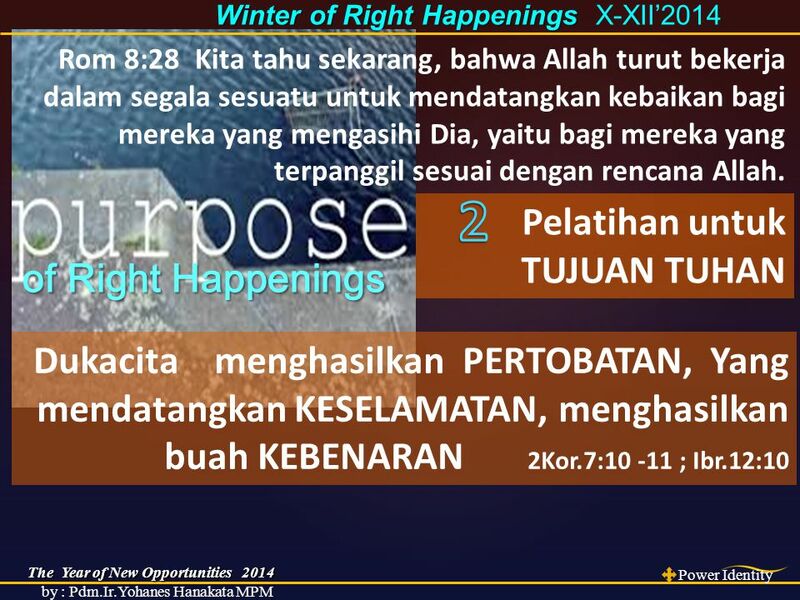 Download ppt "The Year of New Opportunities 2014 Power Identity by : Pdm.Ir.Yohanes Hanakata MPM Winter of Right Happenings Winter of Right Happenings X-XII’2014 of." God... When I find joy in a friend Remind me that there would be an end So I stay with the One who has no end. Toxic Words. The tongue has the power of life and death… Prov 18:21 Hidup dan mati dikuasai lidah, siapa suka menggemakannya, akan memakan buahnya. Toxic—anything. The Year of Wholeness 2012 Power Identity by : Pdm.Ir.Yohanes Hanakata MPM Ef 6:10 Akhirnya, hendaklah kamu kuat di dalam Tuhan, di dalam kekuatan kuasa-Nya. Love comes to those who still hope although they’ve been disappointed,to those who still believe although they’ve been betrayed,to those who still love. The Year New Season of Blessing 2013 Power Identity by : Pdm.Ir.Yohanes Hanakata MPM RISE in The STRENGTH of GOD RISE in The STRENGTH of GOD Winter of. Be thankful that you don’t already have everything you desire If you did, what would there be to look forward to ? Bersyukurlah karena engkau tidak memiliki. RESET. Do not conform to the pattern of this world, but be transformed by the renewing of your mind. Then you will be able to test and approve what God’s. ZONA ILLAHI. Mereka yang hidup dalam daging, tidak mungkin berkenan kepada Allah. Tetapi kamu tidak hidup dalam daging, melainkan dalam Roh, jika memang. Roma 1: Sebab aku mempunyai keyakinan yang kokoh dalam Injil, karena Injil adalah kekuatan Allah yang menyelamatkan setiap orang yang percaya, pertama-tama. Pendidikan Agama Kristen Fakultas Pertanian, Universitas Jambi Semester I - Tahun 2012 Jumat, 12 Oktober 2012, Ruang KFP#106 12:00 - Selesai. 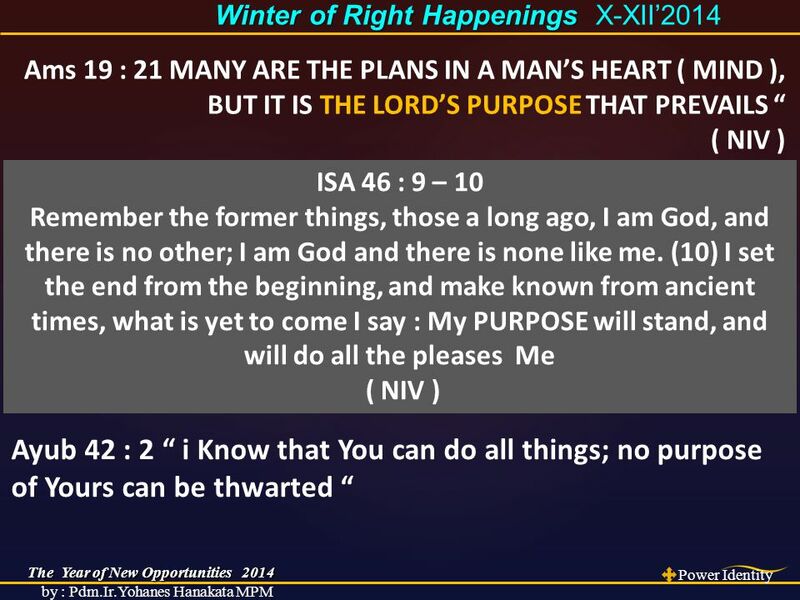 Contentment Philippians 4: Contentment What does it mean to be content? What does it mean to be content? Are you a content person? Are you a content. Once there was a man who asked GOD for Alkisah seseorang memohon kepada Tuhan agar diberikan a flower.... sekuntum bunga and a butterfly.....dan. EXODUS 6:6-8 6 THEREFORE SAY TO THE CHILDREN OF ISRAEL: ‘I AM THE LORD; I WILL BRING YOU OUT FROM UNDER THE BURDENS OF THE EGYPTIANS, I WILL RESCUE YOU. Romans 1: Romans 1:16-17 New Living Translation (NLT) 16 For I am not ashamed of this Good News about Christ. It is the power of God at work, saving. I am Wonderfully Made Psalm 139:14 NIV. Gambar 1 Thank you God for giving me a tongue to taste things with. You give me bread to eat. A sandwich.  14 Namun baik juga perbuatanmu, bahwa kamu telah mengambil bagian dalam kesusahanku.  15 Kamu sendiri tahu juga, hai orang-orang Filipi; pada waktu. RESOLUTION 2015. DECISIONS.. “Do I STAY? Or should I GO?” “Is He (or She) the RIGHT one for me?” “Should I BUY this? Or SELL that?” “Should I INVEST in.